Eating seasonally is just one of the ways we can all reduce our carbon footprint, and even save some money in the process. Since Spring can be an unpredictable season in the garden, cold hardy vegetables and leafy greens are the star of the show this time of year. You can expand the variety of seasonal produce available by incorporating some leftover winter vegetables. Carrots, beets, and even brassicas such as cauliflower and romanesco are a great way of adding more veggies to your diet during the cool spring months! 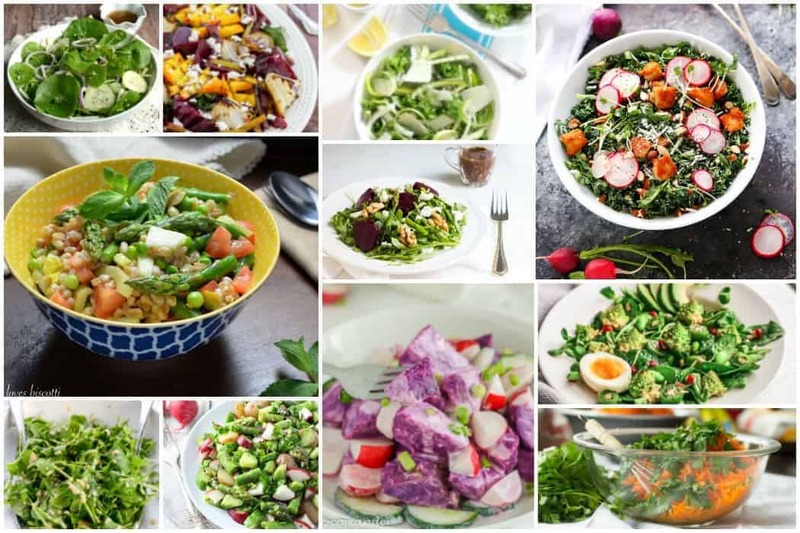 These 11 spring salads are a wonderful collection of recipes from some great food bloggers, showcasing everything from simple to exotic spring produce! Starting with light, green leafy salads, and progressing to hearty winter vegetables, this collection of spring salads and dressings is sure to keep you eating seasonally and maybe even from just your own garden! By eating salads that use seasonal produce, and (preferably) local grown vegetables, you ensure you’re getting the freshest, and most nutritious food possible! 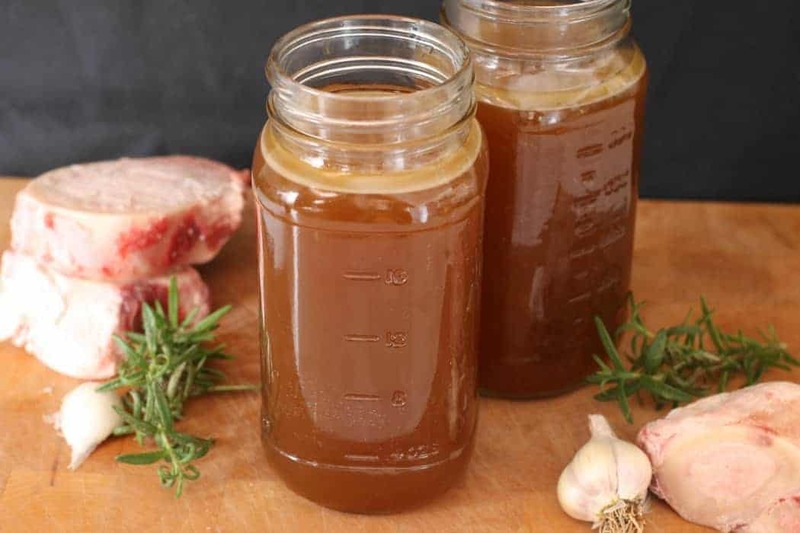 Eat even better by making your own salad dressings and cutting out un-healthy preservatives! 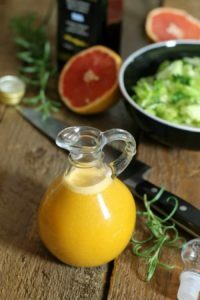 Try this simple Grapefruit Vinaigrette on any leafy green salad for an instant boost of Vitamin C and of course flavour!! Make sure you’re following me on Facebook, Twitter, Instagram, and Pinterest for weekly cooking tips, tricks, new recipes and to stay up to date with everything going on here at Earth, Food, and Fire! Pinning now, and will share with my readers next spring! Gorgeous roundup Markus. They all look so appetizing. I am now ready for spring! Thank you! The only thing missing is some dandelion greens….soon as the snow melts and they start popping up I’ll have to do a recipe! Just love all the variety in these beautiful salads. 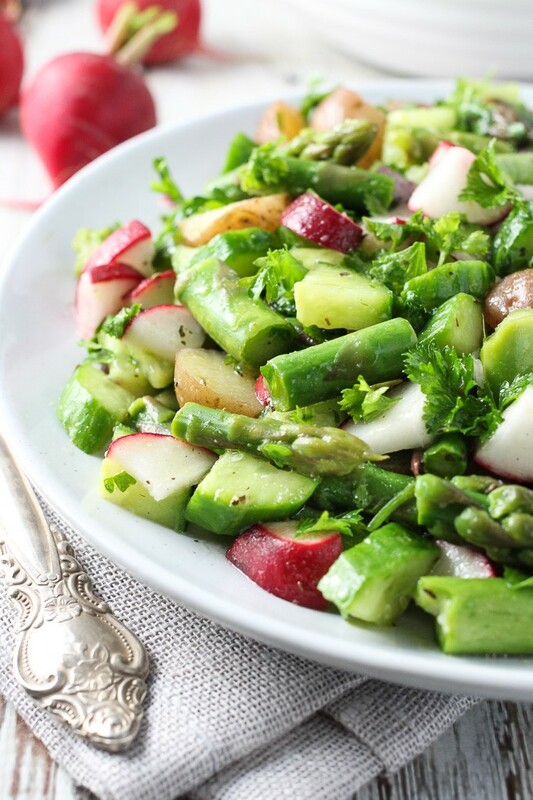 Spring is certainly a time to celebrate fresh, green, crisp food. Beautiful collection! Thanks for including me. Sharing ???? I never get tired of eating salads… so vibrant and great tasting… not to mention healthy! Great round-up, thanks for including mine 🙂 I’ve pinned a few to try… and now I am off to share. I could eat salad all day! I need to make that kale chicken ceaser salad more often! Gorgeous round-up — so much inspiration here for a healthy, colorful table! Thanks for including the French carrot salad — one of my all-time favorites. I can’t wait to try a bunch of the others! Carrot Salad is so underrated! A favorite of mine as well! Thanks for taking part in the round up!